Leslie Buck was a successful businessman and an inspired graphic designer. You may never have heard of him, but I can almost guarantee that you are intimately familiar with one of his classic designs … especially if you live in New York City. 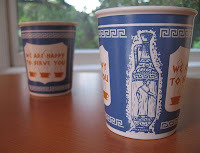 Dubbed the “Anthora” the blue and white paper cup featured Greek vases, steaming coffee cups and the legend “WE ARE HAPPY TO SERVE YOU,” emblazoned in gold. It’s an impressive example of the timelessness of great graphic design. One of the most useful attributes of a public relations practitioner is an ability to think outside the box. The 19th century showman, PT Barnum, was practicing PR even before public relations was acknowledged as a profession. The story goes that Barnum's American Museum was so popular that visitors would spend the whole day there … which cut into Barnum’s profits. So he put up signs that said: “This Way to the Egress.” Not knowing that “egress” was a highfalutin term for “exit,” the customers followed the signs to what they thought was an exotic new attraction — and walked right out the door. If they wanted to get back in, they had to pay again … and Barnum’s profits rose.